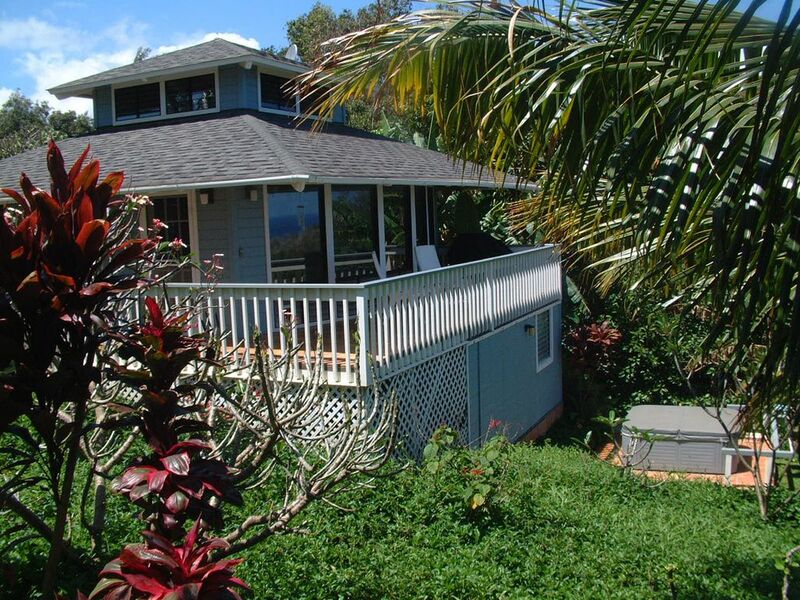 Plumeria Moon is a wonderful cottage on a completely private property overlooking the ocean on Kauai's spectacular North Shore. This home is perfect for couples celebrating their honeymoon or anniversary dream of a secluded tropical hideaway in paradise. The cottage is available with Hideaway Bay, a separately private 2 bedroom home that shares the 3 acre secluded property. Plumeria Moon is very tastefully built with an open Hawaiian style and creative architectural features that take advantage of the amazing ocean view and tropical climate. Recently updated with bamboo hardwood floors, new sofa-sleeper, new paint and ceiling fans, as well as new linens and two flat screen LCD TVs. There are three angled walls with large windows on the side of the cottage that face the ocean which enhance the ocean view and open up the interior space to the tropical surroundings. A well-vented copula roof design opens up the interior space to more light and takes advantage of the tropical breezes. If it gets too warm there is also a very powerful yet quiet split-unit air-conditioning system. Property & Amenities: Plumeria Moon guests enjoy their own Hot Tub with ocean view as well as a luxurious outdoor shower with ocean view (yes, there is a full tile & glass indoor shower too!) There is a beautiful tile lanai for watching whales and albatross while dining or relaxing outdoors. There are no other homes or roads within sight or sound of the cottage and the lush landscaping is alive with colorful flowers and tropical birds. Hot tub, short walk to white sand beach, private sun deck, covered lanai, outdoor shower, ceiling fans, split-unit air conditioner (quiet), complete kitchen with dishwasher, microwave, coffee maker, extra large toaster oven, rice cooker, etc. Bath towels, extra sheets (quality linens), beach towels, beach chairs, coolers, beach umbrellas, rain umbrellas. Plumeria Moon can be rented as an addition to Hideaway Bay, making the 3 acre property a romantic getaway for multiple couples. Keywords: Private, peaceful, tropical home set atop the bluffs of Kilauea Farms on the spectacular North Shore of Kauai. Keep noise to a minimum, especially before 8:00 am and after 10:00 pm. Your neighbors (distant, in our case) probably have to go to work the next day, so please be considerate. Turn off outdoor lights at night whenever possible. We enjoy our dark nights when the stars are bright and beautiful. Of equal importance, our wildlife can become disoriented at night if lights are too bright. Please be sure you park only on property; we have plenty of space for parking and driving on the lawn is ok. If you have any questions about our neighbors or how to best be considerate of them, please call Thomas. Be mindful of the surf. Our shorelines face thousands of miles of open ocean. Northern winter storms and southern summer storms can bring us extremely dangerous surf conditions. NEVER turn your back on the ocean – summer or winter. Rogue waves can appear even in calm surf conditions. There are lifeguards at Haena Beach Park, Hanalei Pavilion, Lydgate, Poipu Beach Park, Salt Pond and Kekaha. For your family’s safety, we advise that you check with lifeguards before going into the ocean. For non-guarded beaches, you should at least check with local residents who are there regarding unseen currents or other dangers. In case of fire or medical emergency, call 9-1-1. The address and phone number of your accommodation is posted on the inside of both bedroom doors. For non-emergency assistance, please call Police Dispatch. Wilcox Hospital in Lihue. The closest emergency treatment center is Mahelona Hospital up the hill on your right as you enter Kapa’a. We do experience flash flooding during periods of heavy rain. If you must drive in this kind of weather, drive with extreme caution. Severe weather could result in the temporary closing of the main road out of Hanalei. On the first business day of each month at 11:45 am, our Civil Defense sirens are tested. However, if you hear these sirens at any other time, please tune to AM radio station KQNG (“KONG”) at AM 570 for real-time reports and instructions. Also, the front of the Kaua’i phone book has emergency, disaster, evacuation and shelter information. Hurricane emergency supplies have been provided and are located over the bathroom in the back bedroom. Although theft is our neighborhood is uncommon, please be cautious with your personal belongings. It is always best to lock up your valuables. Lock your doors and windows when you leave the property. Please honor the posted speed limits. Frequently check your rear view mirror. If more than 4 or 5 cars are stacking up behind you, pull completely off to the side of the road and let them pass. This can also help you when driving at night as our dark roads can be confusing. The cars following you likely know where they are going and can help light the way for you. If you are lost, remember that this is a small island and you will find your way soon. Keep driving until you find a safe place to pull over and turn around. If you can head downhill, you will get to the ocean within a few miles. Never make a U-turn on the highway. When navigating the one-lane bridges, cross the bridges caravan style. It is usually appropriate for 5 or 6 cars to cross at a time. A simple rule of thumb: Drain the lane; if you arrive late – wait. When parking at the beaches, park, or sight-seeing locations be sure to park fully off the street, in assigned or clearly marked parking spaces. If you want to stop to enjoy the scenery, please pull completely off to the side of the road. I have managed and operated Kauai Vacation Hideaway since 2000 when I helped the owner and my friend Mike Testa find this spectacular property. I take pride in providing a wonderful and well-kept location for people to enjoy their vacations. This is a special area of Kauai. It is on the gorgeous North Shore yet has easy access to the East Shore and the multitude of beaches in the area. This location enjoys a dryer climate than most of the North Shore so often we can brag about sunshine while rejuvenating showers fall on areas closer to the interior mountains. outdoor shower, Private outdoor shower with ocean view. The bathroom is clean and open with fresh towels and face clothes. The shower is extra large with a window facing the Plumeria plants and inviting in their scent and fragrance. Also, be sure to enjoy the outdoor shower complete with lush garden surroundings and huge ocean views. While we do our best to provide everything our guests need during their stay, we understand some people have unique requirements. So, if you don't see something you like, please feel free to contact us any time. We are often able to accommodate special requests or create a package of various goodies for our guests to enjoy. Kauai’s North Shore offers world class…snorkeling, river & sea kayaking, hiking, bird watching, swimming, surfing, golf, horseback riding, fishing, deserted beach walking, windsurfing, kite surfing, waterfall tours, movie location tours, helicopter tours, 4 wheel drive tours, sailing, scuba diving, bike renting, tennis, shopping, shell hunting, fine dining, local food dining, farmers markets, sunset watching, live music, and if you stay with us…the opportunity to completely escape from the outside world and spend your days looking out at the ocean, watching for whales, or walking to the secluded white sands beach. Plumeria Moon is true paradise. Perfect place to stay in magical Kauai! The view- we loved waking up to a sweeping view of a little valley running down to the ocean. Having breakfast listening to the waves crash and breathing in the fresh ocean air was great. Location- locates on the north side of the island near a number of fantastic beaches, hikes, and quaint little towns made our stay full of adventure. Outdoor Shower/Hot Tub- The experience of taking showers outside in the middle of the day is incredible and romantic. The property also has a hot tub which is completely private that sits overlooking the ocean. I don’t think there is any way this place could get more romantic. My wife kept joking that staying here is like one extended dream date experiences you only see on tv shows like The Bachelor. The hosts- the property was ready for us when we arrived and the host were easily available if we needed anything. We would recommend a stay at Plumeria Moonto anyone thinking about it. It is the perfect place for a magical, romantic, and adventurous stay in the beautiful island of Kauai. We loved this very secluded, beautifully landscaped cottage! Highlights were the ocean and green views, the privacy, the location in Kilauea between so many great spots on the north shore, and the access to a very quiet beach (down 280+ steps which is good exercise but no real trouble if you move regularly) . Would definitely come back. As others have mentioned, the space and furnishings could use some updates but that didn’t detract from our stay. You could certainly find newer, fancier spaces in Princeville but we far preferred the location and privacy of this well appointed little cottage. The hot tub ocean view alone makes this cottage the perfect romantic spot for all couples. Then you take into account the comfortable queen size bed, the nicely appointed kitchen with full-size refrigerator, ending with the excellent communication with Thomas and you will be hard-pressed to find another place this awesome! We absolutely loved our stay at the Plumeria Moon. We loved the feeling that we were in a tropical rainforest and enjoyed the sounds of nature. We had the beach below the cottage all to ourselves as well. The bed was comfy and the hot tub and outdoor shower were fabulous. Thomas and Emma were great to work with and very responsive. We would defiantly recommend this cottage to anyone. Amazing an private for an unforgettable honeymoon. Very peaceful with a fantastic hot tube. Kitchen very well equipped. Beautiful view from the deck. We really enjoyed our stay here-- it was just the private, cozy cottage that we wanted. The house was well-equipped, clean and comfortable and perfect for a couple. It has an air conditioner, but we never needed it with the ceiling fans on. There were great views of the ocean from the deck and the hot tub. The house felt very private. Although there is a house nearby-- maybe a few hundred feet away-- there are a lot of trees and bushes between you and you never really notice the house or hear any neighbors. You do hear chickens though-- sometimes quite early in the morning-- but that's a novelty you have to expect everywhere you stay on the island. The sandy beach below the house is really stunning, but it's not good for swimming, with big waves and lots of coral close to the shore. There are a few trees around the beach for shade so you don't have to bring an umbrella, and there are beach chairs provided to take with you. The climb down to the beach could be a little difficult for some people (270 steps one reviewer counted), but we had no problem, although I wouldn't plan on going down there more than once in a day. I will say that the steps and trail were very well-maintained-- mostly concrete steps and virtually mud-free, which few beach trails on the north shore can claim. Terrific house, would definitely return. Kauai Vacation Hideaway is tucked away in the extremely private area of Kilauea Farms and only a stroll away from the ocean. Located in the heart of Kauai's spectacular North Shore, there are three acres of lush gardens set atop the bluffs overlooking Pila'a beach. The property boasts a main house, Hideaway Bay, a private cottage, Plumeria Moon, an office/gatehouse, and a private path to a secluded white sands beach. This is truly a unique location with lots of acreage surrounded by farms and wildlife. Only minutes from all the North Shore attractions like Princeville, Hanalei, and Kilauea Town, Kauai Vacation Hideaway delivers true privacy while still being close to all the major North Shore activities. The extreme privacy, hot tub, outdoor shower, lush landscaping, crashing waves, and soft sand make this an ideal setting on the Garden Island for a romantic celebration like an anniversary or honeymoon. Come Live Aloha at Kauai Vacation Hideaway! Golf: Plumeria Moon is only minutes away from one of the finest golf courses in the world. The Prince Course at Princeville is located on the bluffs overlooking the Pacific Ocean and surrounded by incredible beauty and spectacular golf. We have golf packages available and can help coordinate tee-times, rental gear, balls, tees, and gear, and anything else necessary to ensure an unforgettable golf vacation.